Even better than Love Drunk. A great ballad. Nice vocals added with an amazing string section makes this song amazing! Very nice song, wish I'd given this more of a chance and had charted it. ▒ Schitterende samenwerking uit de zomer van 2009 tussen "Boys Like Girls" & "Taylor Swift" !!! Grandoos zangwerk, mooi muziekwerk !!! Volle bak ☺!!! Peaked at #24 on my personal.<br><br>Came in at #103 on my TOP 200 OF 2010. Ah, da waren echte Philosophen am Werk..
Only Boys Like Girls make this song bearable (and push it up 1*). Taylor Swift is terrible as usual. 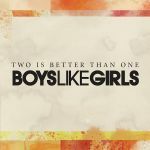 Great pop ballad from boys like girls, Taylor's voice fits in perfectly.